his intensive nighttime moisturizer is formulated to work while you sleep with time-released 0.25% Retinol combined with Bakuchiol and utilizes pioneering Pathway Technology inspired by the Dermal-Epidermal Junction (DEJ) as well as the skin’s own Microbiome to comprehensively address the visible signs of aging overnight. 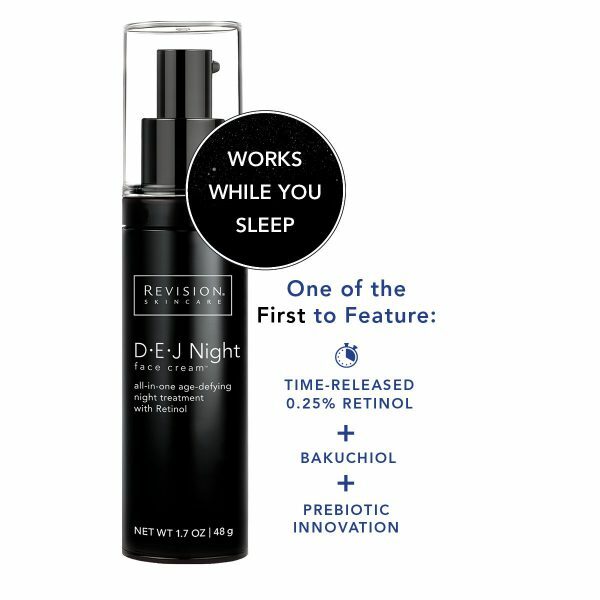 Formulated to work best while you sleep Contains time-released, microencapsulated Retinol to maximize efficacy and minimize irritation, Boosts the efficacy of Retinol with Bakuchiol, Supports short-term and long-term skin health and radiant skin, Helps sagging skin appear firmer and more lifted, Visibly reduces the look of fine lines and wrinkles, Supports the skin’s Microbiome with prebiotic technology. "Vitamin A (0.25% Retinol). Improves the appearance of skin texture and pores. Bakuchiol. Boosts the efficacy of Retinol. Bakuchiol. Boosts the efficacy of Retinol. Palmitoyl Tripeptide-38 & Acetyl Tetrapeptide-2. Help reduce the appearance of fine lines and wrinkles. Rosemary Extract. High in beneficial antioxidants. Astragalus Extract. Gives skin a hydrating boost. Goji Fruit Extract. Provides antioxidant benefits. Vitamin C (THD Ascorbate). Brightens dull skin. Coenzyme Q10 (Ubiquinone). Oil-soluble antioxidant."